Now that it’s officially spring, I am ready to ditch the winter coats and get ready for summer weather. Although it’s still cold in Ohio I couldn’t wait to try Bummis new swim line Splash, so I packed up my little lady and we hit the local indoor pool. Even the families that don’t cloth diaper have a need for a reusable cloth swim diaper. Bummis one-size swim diaper is our go to this summer, and since it fits 10-35 pounds it will be used for the next couple years. You will always get a great fit thanks to the 4 rise sizing options and 6 waist snaps. 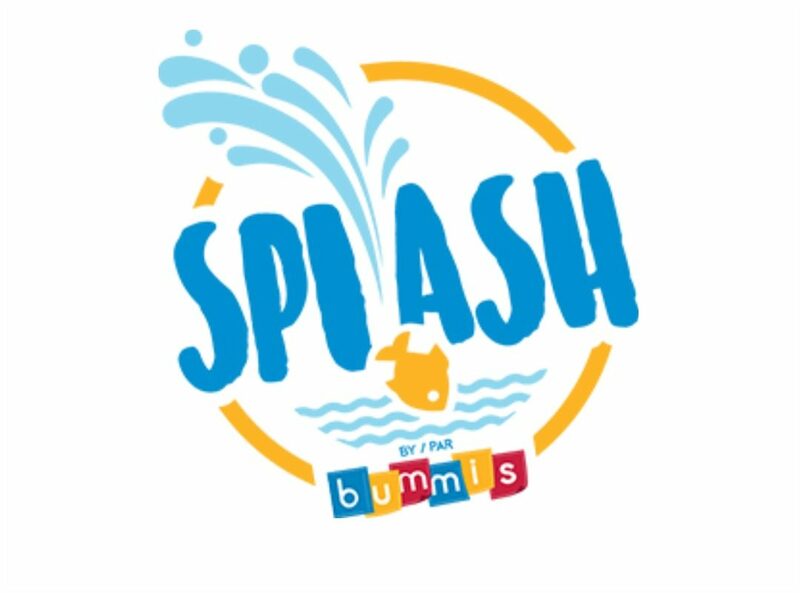 Bummis one-size swim diaper is specially engineered to hold solids in but allow liquids to pass through. This swim diaper has double gusset leg elastics giving a nice snug fit around the leg, keeping everything in the diaper and not floating in the pool. I feel a swim diaper that snaps on is 100% necessary because let’s face it once your child gets into the water trying to slide a wet diaper off (god forbid it contains poop) is nearly impossible. The inside lining is made of super soft polyester making this not only comfortable for baby but extremely easy to clean. I love that Bummis makes coordinating tops to go along with their super cute swim diapers. Choose from a Tankini or a UV Tee. The Splash Tankini comes in two sizes: small for 0-18 months, and large for 18-36 months. The UV Tee is available in four sizes: small for 3-6 months, medium for 9-12 months, large for 18-24 months, and extra large for 2-3 years. Both the Tankini and the UV Tee are made of lycra and provide certified UPF 35+ protection. I love the added sun protection of the UV Tee has with it’s long sleeves. The UV Tee and Tankini are perfect for playing in the pool, hanging out on the beach and water parks. Rinse after using especially if in chlorine water. I always try to keep my little lady’s head covered when we are outside playing. Bummis has it covered with 3 kinds of caps perfect for playing in the sun. My favorite is the Baseball Cap, my daughter has such a small head I have always had a hard time finding a baseball cap to fit her. The baseball cap fits her perfectly and couldn’t be cuter. 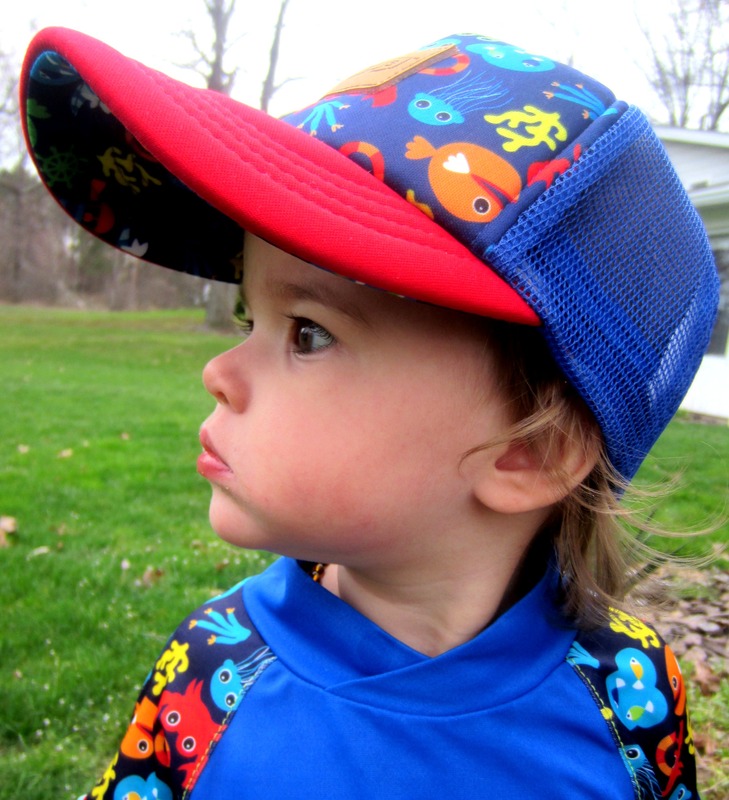 The baseball cap comes in 2 sizes small for 6-18 months and large for 2-5 years. Bummis Sun Cap is ideal for sun protection since it shades both your child’s face and neck. The swim cap is made of lycra and is perfect for playing in the pool. Bummis caps are made to match the other items in the splash line but look great all on their own. Bummis is well known in the cloth diaper community for their high quality product and their “Made Here” philosophy. Bummis is proudly made in Canada and their fabrics come from the USA and Canada. Bummis has everything to make your cloth diaper journey successful including Diapers, Wipes, Potty Pants and Wet Bags. They don’t stop at cloth diapers they also have Snack Bags, Best Ever Bibs, Eye Make-up Remover Pads, Breast Pads and their Fabulous Flo Pads. Love these adorable outfits! Your little lady looks stunning in those bight colors. I am so ready for the swim season also. Wow, these are so cool! I haven’t used Bummis yet. Living in LA, I could use all of this stuff, though! Omgosh talk about adorable!! I love the coordinating pieces!! I love cutting down on the unnecessary swim diaper waste in the summertime!! This sounds like a wonderful diaper! 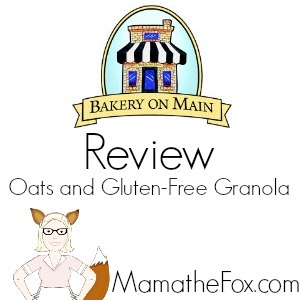 Thank you so much for the review! This sounds like a great diaper for my new grandson!I love the beautiful color combos. New dad here. I had wondered how people took babies into pools and swim diapers make perfect sense. Thanks for the review of this cute and very helpful product. I agree about the t and like the SPF protection. These outfits are so cute. These Bummis Swimline are a must for every parent. Perfect for splashing around in. I like the UV tee a lot. I always worry about my little one getting too much sun. These would be awesome to have during the hot summers in Southern California. We have a pool and these would help. The patterns on them are super cute too. This sounds like a wonderful product. Thanks for the review and chance to win! 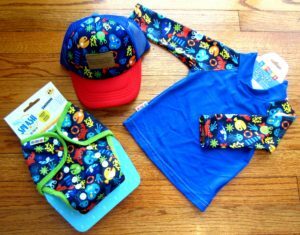 I really like that they have a matching long sleeve swim shirt & hat that matches the swim diaper. I also appreciate that the swim diaper will fit them for so long. The prints are so cute too; I would love the little clown fish one my LO. It is so fun to have the matching accessories. Growing up my mom could have used reusable swim diapers as we were at the pool a lot. 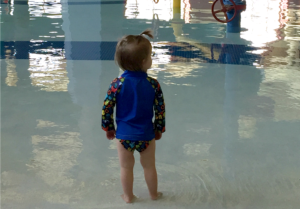 I love that the swim diaper goes up to 35 pounds! I love the matching swim tops and hat! The sun protection they offer would be helpful in the SC sunshine this summer! 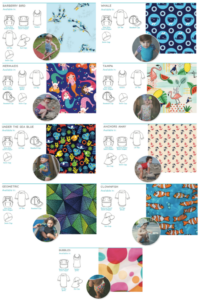 I love that Bummis’ products are made in Canada and sourced from fabric made in Canada and the USA! The swim diapers looks awesome! I love the fact that it is one size and allows liquids to move through easily, which some people don’t understand. My daughter loves the water and would love the cute prints available!